Chennai Super Kings (CSK) is having a great run in the Indian Premier League (IPL), 2019. CSK has only lost one match against Mumbai Indians (MI) till now and is currently on top of the point table with 14 points. 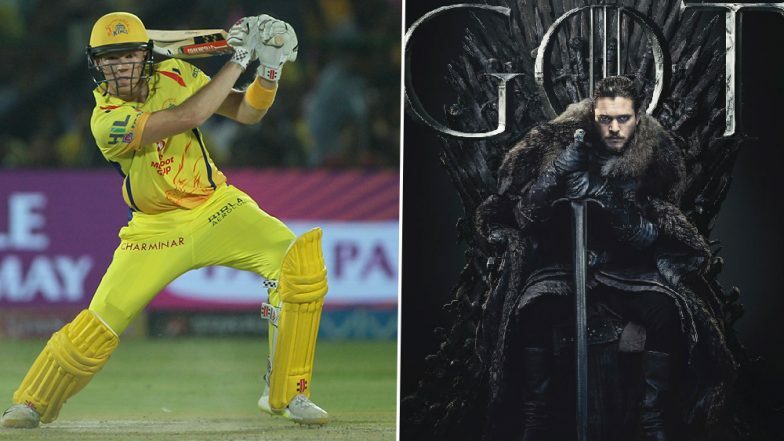 CSK right-handed batsman Sam Billings wants to know where to watch Game of Thrones Season 8 Episode 1 in India to which netizens came to his rescue. KKR vs CSK, IPL 2019 Highlights: Chennai Super Kings Beat Kolkata Knight Riders by Five Wickets. CSK won their last game against Kolkata Knight Riders (KKR) by 5 wickets where they chased down the total of 161. Sam Billings is part of England Cricket Team who is also a wicket-keeper. Billings has played 21 matches so far in his IPL career where he has scored 334 runs with the highest score of 56. Game Of Thrones Season 8: Here's How Netizens are Killing Time Ahead of the Premiere of Episode 1. Anyone know how to watch Game of Thrones in India please? Hotstar do I just sign up? Thambi Sam B, subscribe to hotstar. If you aren't able to, DM me. I'll give you my credentials. Anything for a fellow GOT & CSK blood. Sam Billings indeed must have at least known by now ways to watch Game of Thrones in India. Game of Thrones Season 8 episode 1 was aired on Monday morning April 15, 2019, in India and next episode of GoT will air on April 22.